* Covers only the first six months of FY 2014 (October 2013 - March 2014). The latest available data from the Justice Department covering the first six months of FY 2014 indicate that substantial changes are occurring in the criminal enforcement of the immigration laws, particularly among those districts along the border with Mexico. Overall, the new data document a drop in the number of criminal prosecutions for illegal entry under 8 USC 1325, but a continued rise in prosecutions for illegal re-entry (8 USC 1326). According to the case-by-case records analyzed by the Transactional Records Access Clearinghouse (TRAC), during the first six months of FY 2014 there were a total of 15,578 criminal prosecutions for illegal entry, and 19,831 for illegal re-entry. Thus, as shown in Table 1, the largest component of criminal prosecutions for all immigration offenses is now for illegal re-entry under 8 USC 1326. This marks a significant change, since in recent years prosecutions for illegal entry — a petty misdemeanor — had outnumbered those for the more serious felony charge of illegal re-entry (see Figure 1). As noted in TRAC's earlier report tracking these trends, during the Obama Administration (as of FY 2013), illegal re-entry has experienced the sharpest growth rates among lead charges cited in immigration criminal prosecutions. 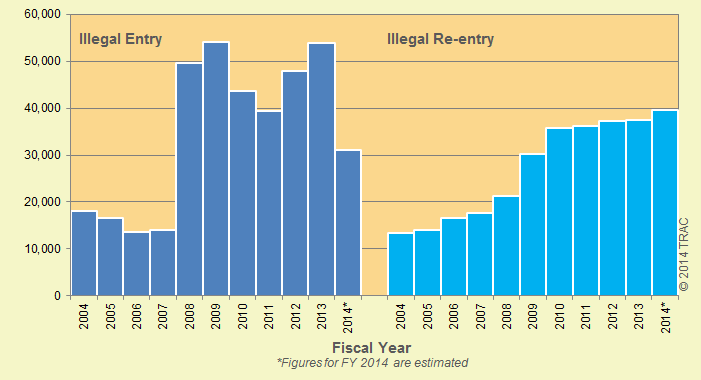 So far in FY 2014, illegal re-entry has now overtaken prosecutions for illegal entry. What Happens After Individuals Are Charged with Illegal Re-entry? Most citizens charged with a crime in the federal criminal courts end up pleading guilty; the same is true for noncitizens. Sometimes as an incentive for pleading guilty, the prosecutor agrees to reduce the charge and hence the potential sentence. This type of plea bargain can occur in immigration cases where the prosecutor charges a non-citizen with illegal re-entry, but is willing to reduce the charge to illegal entry in exchange for a guilty plea. How often is a felony charge of illegal re-entry pled down to the petty misdemeanor of illegal entry? The pattern appears to differ sharply depending upon the U.S. Attorney's office. For example, in three southwest border districts — New Mexico, the Southern District of Texas, and the Western District of Texas — the data show that these types of plea bargains have been rare during the past seven years. In Arizona, according to government data, plea bargains of this nature are quite common and appear to be rising. By contrast, in the Southern District of California, the data indicate that this sort of plea bargain — while once common — has become more unusual in recent years. This fact of different charging practices among U.S. Attorney offices therefore complicates the picture that is reflected in the national trends shown above. District-by-district trends in prosecutions for illegal entry versus illegal re-entry are discussed in the sections that follow. Because most immigration prosecutions occur in the five judicial districts along the country's border with Mexico, we focus here on these border districts. Our examination again is based on the original charges filed; a subsequent report in this series will examine how these trends differ when convictions — instead of the original charges — are compared, and the role that different U.S. Attorney charging practices play. 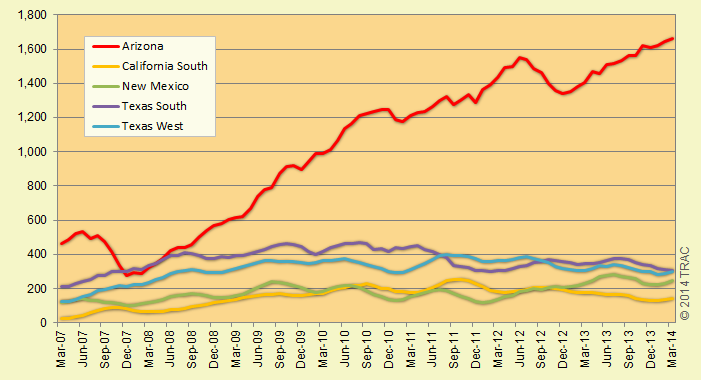 Since 2011 the Southern District of Texas has seen the highest volume of prosecutions for illegal entry, followed by the Western District of Texas. Prosecutions in those two districts spiked at the end of calendar year 2012. As TRAC noted in an earlier report, this jump occurred because of a rapid rise in referrals from Customs and Border Protection, particularly along the border in these two districts around Del Rio and Laredo. However, following this spike, starting around June 2013, prosecution numbers began dropping. Figure 2 shows these trends quite clearly, and the actual counts are given in Table 2. To make the trends easier to see, the plotted lines represent a moving monthly average of the actual prosecution counts calculated over the preceding six-month period. The drop-off in illegal prosecutions, while most visible for the Texas border districts, has not been limited to these two districts. As we see in the district-by-district trends shown in Figure 2, there has also been a fall in prosecutions in Arizona, although that trend began perhaps six months or so earlier than it did in the Texas districts. More recently, starting in August of 2013, there has also been an observable drop-off in prosecutions for illegal entry in New Mexico. Trends in prosecutions for illegal re-entry in each of the five border districts (shown in Figure 3) appear quite different from those seen earlier for illegal entry. Here again the plotted lines represent a moving monthly average of the actual prosecution counts shown in Table 3. 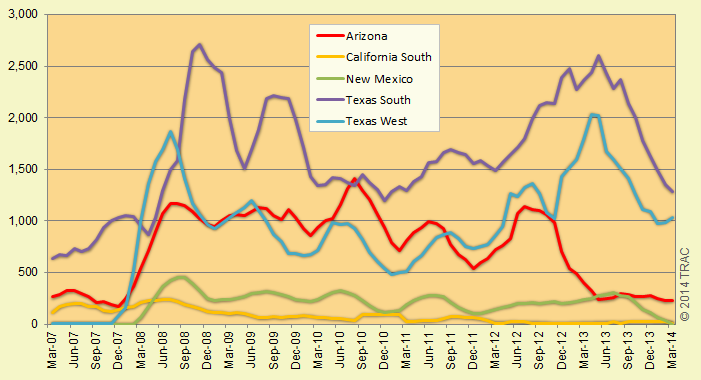 While the two Texas border districts had the highest illegal entry prosecutions, the data indicate that Arizona clearly dominates in prosecution numbers for illegal re-entry. Moreover, the gap between the prosecution numbers in Arizona and the remaining border districts has been steadily growing. Indeed, the national trends are almost entirely a reflection of the trends in Arizona. Generally, aside from minor variation, recent trends in the other districts have been relatively flat or falling.